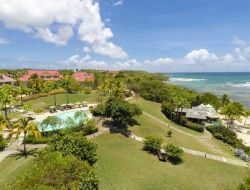 For your seaside holidays in Guadeloupe, rent of one charming completely fitted out and air-conditioned studio which can welcome up to three people in a cosy atmosphere. Holiday rental situated in a secure residence by the sea (20 m). In 5 minutes of the city center close to all shops. Possibility to discover the culinary specialities of the island. 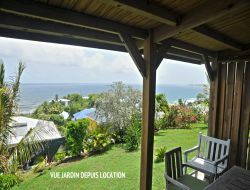 Gite with beautiful sea view on Guadeloupe island : beautiful 2 rooms of 40m² on garden floor of a seaside villa in Le Moule. Holiday accommodation for 4 people with 1 bedroom + 1 living room with kitchen area. Terrace. Garden at disposal in front of the apartment. Self-catering apartment F3 in the 1st floor of a villa situated on a hill with circular terrace and a very beautiful sea view (with a beautiful sunset). 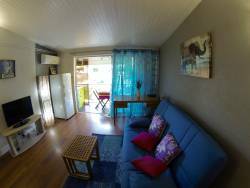 Holiday rental for 6 persons with 2 bedrooms. 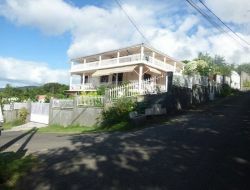 Between Sainte Rose and Deshaies, small structure of 5 gites 2 ** with pool and spa. Nestled in a beautiful tropical garden, you can enjoy the large communal pool and its proximity to all shops and the beach just 900 meters. The ideal place for a holiday in the tropics. 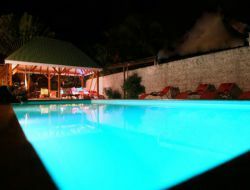 Holidays in Guadeloupe in a charming Creole bungalow in a tourist complex with large swimming pool, tropical garden and restaurant with creole specialties. 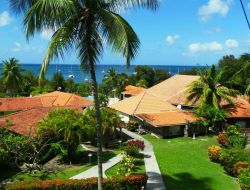 Its location between Grande Terre and Basse Terre, allows a quick access to all tourist sites of Guadeloupe (airport to 20 mn). 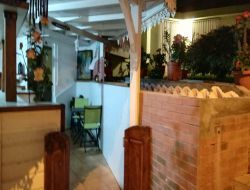 Gite of 40 m², 2 air-conditioned bedrooms, equipped kitchen, covered outdoor terrace, tv, internet, washing machine, linen provided: bed linen, toilet, kitchen. 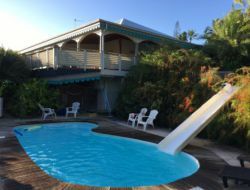 Holiday rentals in Guadeloupe, in the peace, with a sea view, in a private garden, in 5mn of the renowned beach of the Caravelle and the city center of Ste Anne where you will appreciate its walk along the seaside, it's colored market, the numerous restaurants and the shops. Gites 2-6 persons situated in the cove Allegre at St Rose, 200m from one of the many beaches on the leeward coast, 7km walk on the beach 200 m from shops, catering, restaurant, doctor, Nurse ... Cottages fully equipped, air conditioned, comfortable with large terrace and pool. Gite for 6 persons, 2 air-conditioned bedrooms, calm, in the center of the island with an easy access to the south and north beaches, at 10 km from the airport and 100m from the supermarket. Rent of a beautiful studio for couple, entirely air-conditioned, in a Paradisiac residence. We can admire the sunset since the big terrace! 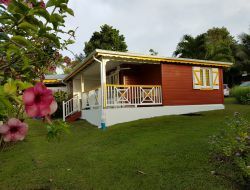 Seaside standing holiday residence in Guadeloupe, between St-François and Pointe-à-Pitre. 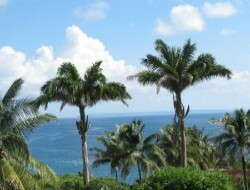 Holiday rentals for 3 to 6 people, benefiting for the most part of magnificent sea views. Holiday accommodations with air conditioning and quality equipments. The Premium district welcomes a swimming pool and a beach. A space Deep Nature Spa proposes a fitness room, massages and care.